When I started riding a road bike nearly five years ago I didn’t have any idea that there was actually a technique involved in braking. If I wanted to slow down I just grabbed either or both of the brake levers and it seemed to work. I had no notion that the front and back brakes have a different role and that there was actually a technique involved in using them. I, like so many newbie cyclists used my brakes far too much, particularly when cornering. So I thought it would be helpful if I shared some of what I have learned from others and from my own research. In Australia and some other countries, the brake lever for the front brake is on the right hand side of the handlebars and the rear brake on the left hand side. Unless you’ve bought your bike overseas or had your brakes altered, then this will be the standard set up. When braking, your front brake is there to stop you and the back brake is there to shave off speed. 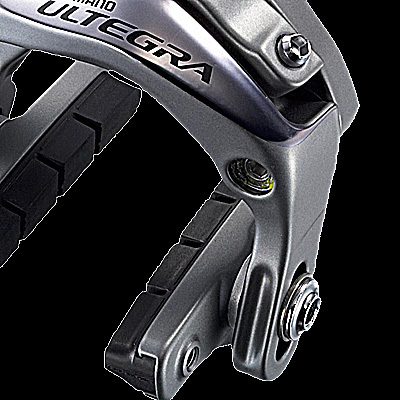 Roughly 70-80% of your stopping power comes from the front brake. Leaving 20-30% for the back brake. Try standing on the ground over your top tube and applying the brakes one at a time and pushing your bike forward. You’ll see how this really applies. For most riding you should have your hands in a position where you can brake easily. In most cases this is going to be with your hands on the brake hoods. That doesn’t mean you can’t ride with your hands on the top of the handlebars but it should be reserved for times when you know you are unlikely to need to brake quickly. Some experts say you should never brake when cornering but this is a bit unrealistic, particularly for new cyclists whose natural instinct is to slow down when they have to go around a corner. Be aware that the harder you brake the more your bike wants to straighten out, which obviously makes it harder to go around a corner. Instead you should feather your brakes lightly and wash off your speed before you enter the turn. Then turn with minimal or no braking. If you grab the brakes too hard when you are descending the bike will be difficult to handle and may even send you over the handlebars. Use both brakes evenly but brake lightly to wash off your speed, then release them and repeat as required. If you apply both brakes continuously they will heat up too much. When you hit the brakes hard in an emergency situation your bike slows down or stops and your body keeps going, sending your weight forward over the front wheel. To counter this effect you need to shift your weight back on the saddle. It’s worth practicing this rather than having to remember in a real emergency situation. Your rims will be less grippy in the wet so brakes will work less effectively so ride more slowly and allow more room to stop. It all sounds great in theory and definitely requires practice. Even after five years I still find myself braking too much, although being conscious of how the brakes actually work really helps me continue to improve my bike skills. Good luck.